A relatively new concept, self-compassion has been hailed as a more robust alternative to self-esteem. While compassion refers to the demonstration of sympathy and concern for others in times of suffering, self-compassion means showing this same understanding to ourselves. One of the first skills needed for self-compassion is self-kindness—extending compassion to yourself even when you feel like you have failed. This can be challenging, to say the least. Often when faced with failure, we assume self-criticism is necessary in order to motivate strong future performance. But in reality, this strategy often falls flat. Giving oneself a harsh scolding doesn’t just make us feel bad, it also interferes with our ability to calmly examine a situation and identify what to change in order to improve—an essential component of psychological resilience. Perhaps this explains why studies have found positive associations between self-compassion and psychological well-being, physical health, and strong relationships. But what does all of this have to do with running a marathon? Training for a marathon can revolutionize self-perception, making kind self-talk—where you speak directly to yourself either mentally or out loud—easier for even the most reluctant. This shift isn’t prompted by changes in physique, but of mind. After dedicating oneself to a marathon, the body receives a perceptual upgrade and transforms into an essential tool. You begin to see the true value in your own body and the strength that it has. Research suggests that working toward purposeful goals enhances our sense of self-worth. So under the conditions of marathon training, self-care—looking after ourselves physically—is not only viewed as essential for performance, but as something we deserve. Commit to a goal, and invest time, energy, and emotion into that goal, and anything that threatens the performance of the body—the vehicle needed to carry you to your target—is unacceptable. This relates to the second element of self-compassion: a balanced perspective. Described as caring for ourselves in an enduring way, a balanced perspective ensures happiness and health in the long term. This can be tricky, given we are typically geared toward instant gratification. We often struggle to connect the immediate rewards of pleasurable items, such as food, alcohol, and cigarettes, with their long-term consequences. However, training for a marathon can help perceptual balance, because it directs our attention away from our immediate concerns and toward the future. Research suggests that goals cognitively activate stimuli that help us achieve them. 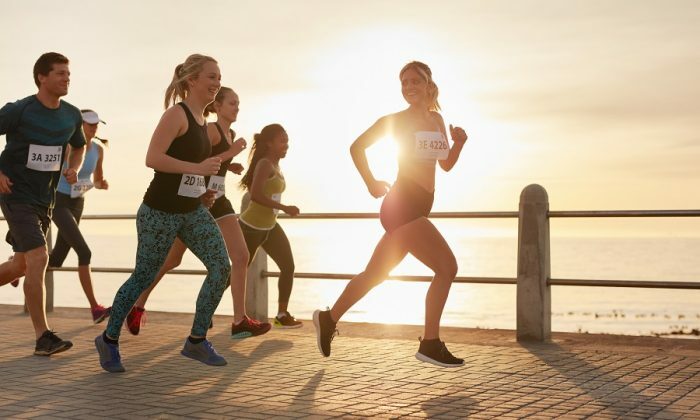 This means the motivation to complete a marathon makes activities relevant to our long-term health implicitly attractive and easier to engage with. More specifically, setting a goal that requires us to plan and monitor progress over time can help to bridge the gap between current and future happiness. Sticking to a schedule and receiving feedback, such as identifying weekly mileage goals and achieving new distance targets, can make us more willing to make choices that will benefit us later on. This might be resisting the instant pleasure of one too many drinks on a Friday night, or getting enough sleep so that we are feeling our best for training. The third and final component of self-compassion is common humanity. This refers to the understanding that suffering is a natural and shared part of being human. Based on the idea that feeling isolated in our pain exacerbates perceptions of inadequacy and insecurity, common humanity is an important part of avoiding negative cycles of self-pity. Running is sometimes considered an isolated and fiercely competitive sport, but this isn’t necessarily true. Runners often step in to help one another in times of difficulty—like Matthew Rees, who helped fellow runner David Wyeth complete the last 300 meters of the 2017 London Marathon to the detriment of his own timing. Running provides a sense of human connection because it shows that struggle is normal. Being one in a field of thousands, communally suffering in the pursuit of a common goal, is paradoxically satisfying. It also allows us to appreciate just how small we are in the scheme of things. So, while marathon training may be painful, sometimes we have to experience a degree of suffering in order to truly value ourselves, to appreciate others, and to learn what it means to be self-compassionate. Rhi Willmot is a researcher in behavioral and positive psychology at Bangor University in Wales. This article was originally posted on The Conversation.